“Qu’on se figure un vallon agreste et sauvage, fermé au levant par une masse de rochers dont les plateaux supérieurs s’élèvent en amphithéâtre” – thus wrote Charles Nodier about the beauty-spot the source of the River Lyson which inspires this piece by Coste. 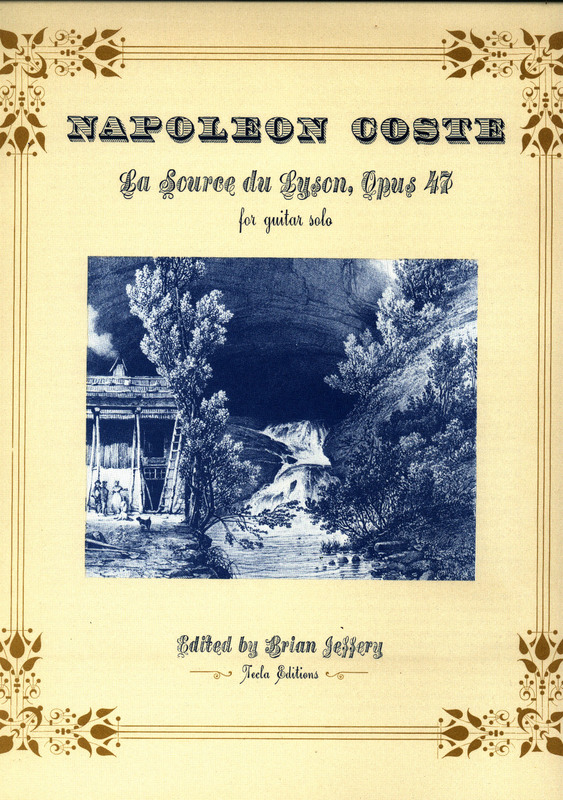 This is a re-engraved edition of Napoléon Coste’s La Source du Lyson op. 47 for solo guitar, a long and interesting piece which includes a “Rondeau Villageois”. There is an extensive preface by Brian Jeffery including much original research about this piece and its history. 12 pages. First published by Tecla in 1982. Coste’s La Source du Lyson for solo guitar is an example of the growing interest in romantic nature and actual places during the nineteenth century, the celebration of country life in art, just as in Berlioz or in Beethoven’s Pastoral Symphony. The source of the river Lyson is a noted beauty spot in Coste’s native region of France, the Doubs. Read the complete preface. This long preface is a major piece of research on Coste, giving many details about Coste, his background in the Doubs, the relation of this work to the Doubs, Coste and the painter Courbet, etc. It is recommended to anyone who is interested in this composer. The picture on the cover is from a travel book by Charles Nodier, author of the novel Trilby. I’m sorry to say that because of damp in a warehouse in the past, all our copies have some rust on their staples (not very much, but it is there). Please be aware of this when you order. Of course remember that the music is fine and it’s a very good piece with (I hope) a good introduction . . .
Schubert Lieder with their piano accompaniments arranged for guitar by Napoléon Coste, edited and with an introduction by Brian Jeffery, the first modern edition of these Coste arrangements.